One of the Trump administration’s proposals would change the prices Medicare pays for certain prescription drugs by factoring in the average prices Europeans pay for the same medicines. A new drug to treat postpartum depression is likely to reach the U.S. market in June, with a $34,000 price tag. The approval of the drug by the Food and Drug Administration comes on the heels of another approval, just two weeks ago, of a different antidepressant, whose retail price will be as much as $6,700 a month. Those giant list prices send shivers through the insurance industry and across the federal government and state governments, which pay for about 40 percent of prescription drugs sold in the United States. The Trump administration is working to bring those prices down. The Department of Health and Human Services in recent months has proposed a series of regulations aimed at reshaping the prescription drug market. The goal, administration officials say, is to create more competition and lower costs. But economists and analysts, who applaud the efforts to bring clarity to what is now a murky pricing system, doubt the effort will actually cut total spending on prescription drugs. The biggest change proposed by HHS Secretary Alex Azar would upend the entire system that sets the prices for medications that people buy at their local pharmacies. Today those prices are negotiated in secret, as rebates between drug companies and middlemen known as pharmacy benefit managers. The PBMs often keep a share of the rebates for themselves, and when consumers have to pay for their medications, to meet a deductible for example, they have to pay that full pre-rebate price. Those discounts would no longer be secret, and consumers who have to pay for some drugs would pay that discounted price. The plan would not only help consumers at the pharmacy counter, Azar says, but also motivate drugmakers to lower their inflated list prices. HHS is accepting public comments on this proposed rule until April 8. The change is revolutionary, says Dr. Walid Gellad, director of the Center for Pharmaceutical Policy and Prescribing at the University of Pittsburgh. 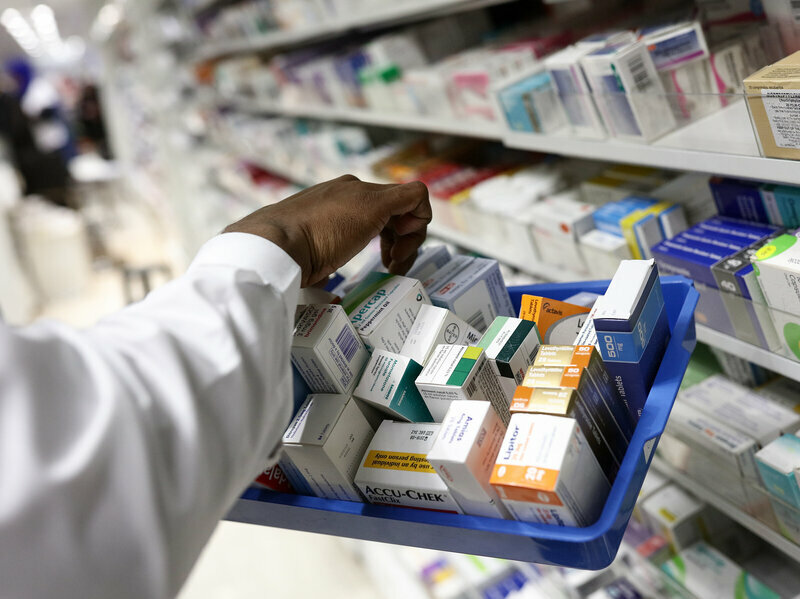 But Len Nichols, an economist and the director of the Center for Health Policy Research and Ethics at George Mason University, doubts that the changes will end with overall prices being lower than the deals that pharmacy benefit managers get today. The drug market is not like a normal retail market, Nichols says, because it’s dominated by a few powerful companies — the PBMs — that are practically required to buy almost all the products offered by the drug companies. In that type of system, price transparency can lead to higher prices, Nichols and other economists say. In October, Azar also proposed requiring drug companies to include the list prices of their medications in television and magazine ads — that proposal is still pending. Drugmakers oppose that requirement because, they say, those list prices are irrelevant precisely because of the rebate system. Nobody pays the actual list price, they argue. But there is some evidence that drug companies don’t want the huge price tags they put on their products to be widely publicized. That “naming and shaming” of companies can have an impact on their behavior, says MIT’s Fisher Ellison. Still, she says, while the focus on publicizing prices for consumers seems like it should work, it may not have much effect on overall spending. That’s because consumers not only don’t pay list prices but also don’t really choose which medication they’re buying. That decision is in the hands of their doctor. And, unlike with toothpaste or soda, it’s not easy for a consumer to switch brands of medicine. “You can imagine a patient walking into a pharmacy, and he has a prescription for Lipitor and then finds out that Zocor, which is a similar drug, is a lot cheaper. Well, there’s nothing he can do at that point,” Ellison says. When it comes to driving down prices, analysts say HHS’s third proposal is likely to work. That plan would tie the price that Medicare pays for drugs that are administered in a hospital or clinic — such as IV drugs for cancer or arthritis — to the prices paid in other countries. That proposed rule — which has received more than 2,700 public comments — is facing steep opposition from the U.S. Chamber of Commerce, which has been running an aggressive campaign against the proposal. It’s unclear when the proposal might be finalized. And doctors who administer the drugs are also opposed, saying it may hurt patients’ access to medications. But Azar dismisses that argument. He says the U.S. price for a drug will still be higher than prices paid elsewhere and says he doubts any companies will stop selling their products in the huge U.S. market just because prices are lower than they are today.